A little Kindess...Does it really Kill? I have been very busy lately but have missed writing about my virtual world experiences, so I am back. I must say I am still enjoying myself in Secondlife, Inworldz, and now OSG. They all have their perks. I like Secondlife because its where I started, I like Inworldz because its where I got my new start, and I like OSG because I can control my regions. Though most of my experiences have been great, I must say I was taken back but some people recently who were rather upset about how I rewarded a friend for helping me with something. I have had a scripting issue in Inworldz since Phlox was rolled out. I am a cut and paste scripter so I had no idea what my issue was. I had tried to ask people for a long time if they could fix it to no a vale. I finally find someone in SL who is willing to come to Inworldz to fix it for me. He was also my RL husband's friend.He does so in less than an hour. I was thrilled. I asked him how much did I owe him. He asked me if instead of paying me, perhaps we could do a trade and he could have a store on my land. I thought it sounded fair to me, especially for as long as this broken script had plagued me. He is a fan of my husband's and had supported his music since he started. I told him to choose a spot that was empty and he could have it. I had done trades with people before and just took the box which didn't seem to bother anyone. However, this time was different. The day he started setting up I had a house renter iming me asking me what was going on. I explained that he was my husband's rl friend who had helped fix a scripting issues I had so I was letting him have a small store. I am not quite sure why she was concerned with the stores since she was renting a home, but she was very bothered about it. She imed me, and my husband several times calling him a squatter and saying it wasn't right.By the end of the week, she took her things and left. I was a bit surprised. So, my question is, was me letting him take a store instead of money from me wrong? I thought it was a mutual exchange that would not be bothering anyone. I will never understand people I guess, no matter how much I try. I have been rather frustrated lately with my encounters with sculpt shops, texture creaters, and template shops. Just the other day I purchased several sculpts on SL Marketplace that I had intended to use with a new line I am creating for both SL and Inworldz. Upon receiving the box in SL, I was forced to click a TOS box before I could receive the item I purchased. I accepted because I saw no way to get a refund. Additionally, I have purchased sculpts from others on marketplace that list no restrictions. However, when I open the box in world, I see a card with the TOS in my inventory. When I read it, it states you may not use these sculpts for any grid other than Secondlife. Anyone using these templates in any other grid other than Secondlife risks legal action. I can go on and on with my encounters of sculpt makers and texture makers who have similar TOS. I try to be polite and always ask if I am not sure what the TOS are before I import to other grids, however I have had people be rude to me more than understanding. Of those who I asked who did not allow me to, only one person was polite and gave an explanation as to why she does not allow her sculpts to go to other grids. One texture maker told me I could use her textures in other grids if I paid her 5000 USD. Really? They are not even products. I don't intend to devalue the work of texture, template and sculpt creators. I always offer to buy a license when I inquire about importing. One texture maker told me her preference as to what grids to not take her items to, but was quite honest in saying she really could not police all of the grids so she appreciated me even asking. So my question is this: Why is there this sudden influx of unrealistic TOS. What harm is it if one is using textures of sculpts in another grid? I understand not wanting your stuff in FP floating throughout the metaverse. But if someone asks you to use your items, they most likely do not intend on using it for malice. It is the people who never ask you need to look out for. Ok, that is my rant for the day. Have a wonderful one! 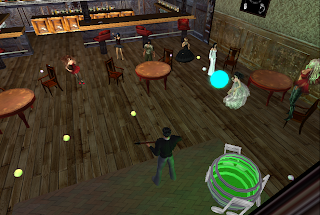 When I first arrived in Inworldz, there was a plea for things to do: events, live concerts, hunts, etc. It seems their pleas have been heard. 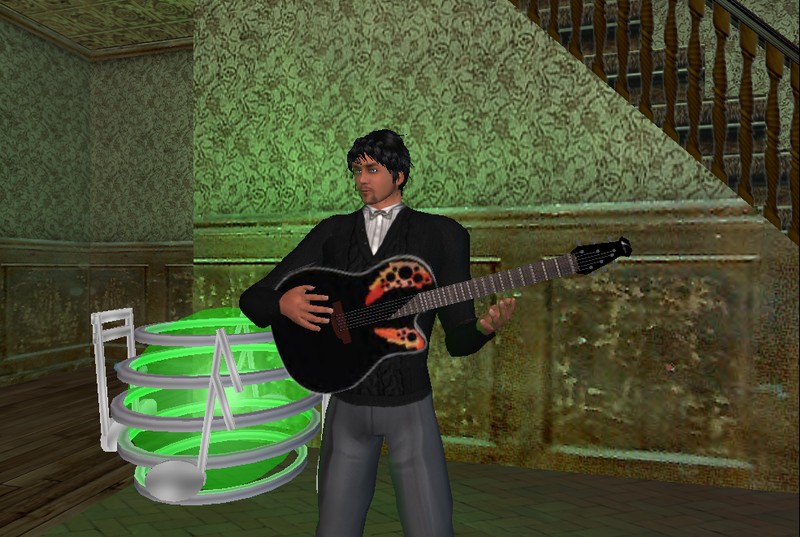 Many DJs and musicians have come to Inworldz at least part time. Most do this because they enjoy what they do. Some thought it would be a quick buck, and left, which is a good thing. We do not need that kind around. 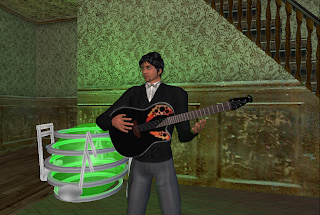 Tonight I invited David Csiszer from SL to play in Inworldz. He is my real life husband, so it is easy to get him on a fly :)This is not the first time he has played in IW, but he is starting to make more of a presence. Here is an overhead shot after several had already left. As you can see, there ARE things to do. In fact, too many now! It is very hard to schedule an event that does not conflict with someone else's. Here's to many more fun evenings at events. I have heard a lot of virtual world comparisons, grid bashings and what have you lately. I have had a little experience with some of the grids. However, I am going to focus on the one I have come to call home. I began searching for an alternative grid actively when SL began imposing regulations and began suggesting they were going to merge the adult and teen grids.SL had turned into a place I no longer liked to be at. There were BIAB things at many malls, and there WERE many, many malls. (nothing but malls!) It had lost its appeal to me. My businesses began to not be very profitable because there was an oversaturation of markets, and of the increased costs that SL continued to impose. I first landed in Legend City. Many people know how Legend City ended. For those of you who do not, basically, anyone who was on the grid lost everything they put into it with no warning. I was renting land from a land owner and had literally spent hundreds in upload fees to get my items into this grid. One day, I tried to log in, and I no longer could. The ATM that was used to transfer funds from one grid to another had disappeared from SL, and all the money, RL and their form of money, was gone. We received no warning. It made me shy away from investing in any grids for a while after that. Then one day an alt I have in SL received a notecard about Inworldz. I created a dummy account to go in and investigate it. It seemed friendly enough. I still felt like it was in the early stages, though. I did not have the patience to keep rebaking myself, reattaching prims etc. So, I kept the account, but did not go back. Then someone else sent me a link about Inworldz; someone I trusted. She said it is growing fast and was the most viable of the ones out there. I thought I would go back and check it out. This time, I created an account with my Karmen avatar ( I had forgotten the name of my alt :)). My first month or so were a little hairy. However, I could see that Inworldz was in deed the most viable alternative grid I had found. I bought a sim, and set up. I was very impressed with the professionalism of the staff and how quickly I got replies to questions when I asked. I had problems on my sim and one of the staff actually stayed in IM with me for at least 20 minutes helping me figure out my problem so it could be fixed! I was rather shocked to get an IM from him. As months have gone by things have drastically improved for me. To those who are on forums and are complaining about them having swiss cheese skin, or their ankles around their ears, I ask them, when is the last time you logged in? I have not had either of those problems in at least three months. When I first began bringing my business into IW, I would oftentimes build in SL, then import because it was frustrating to build in IW. I no longer do that now, though. 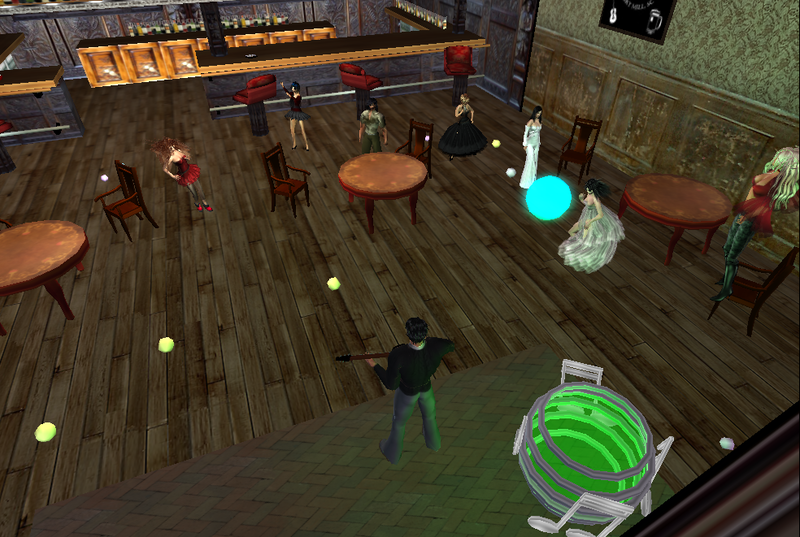 Inworldz does still lack physics, which is coming but there is no exact dates for that. I do not roleplay or have many items that require physics, but I know some are desperately seeking it. You can tell by Elenia's monthly reports that the economy is growing. I have personally seen no instances of copybotting, which some say is running rampant in the alternate grids. I am not going to say there never has been any instances in IW, I just know they work very fast to take down instances that have been verified. So I personally have not experienced seeing it around. I have seen a lot of people selling items from kits. There is nothing wrong with that. I, myself have some of these items. I think that if people see multiple instances of some of these kits, they may misinterpret the sellers as copybotters. I have tried to be more careful with what I use from kits. If people are using kits, they need to be sure to change things up.It gets boring going shopping and seeing the same thing 5 times. So all in all, I am very pleased with my experience thus far in Inworldz. People can trash it, say it is lag city, make fun of it and call it a wannbe grid, etc. But the bottom line is being there makes me happy and that is where I choose to make my home. I was totally ignorant of virtual worlds prior to 2005, but I am always up for trying something new. So when my husband told me to try out this new "game" he found that appeared to be a bit like the sims, which I had loved for a while, I thought, "Why Not?" That day, I began my journey into Second Life. Second Life baffled me. I could not believe that there were so many different people in a place such is this. I met people that were animal avatars, people with giant appendages of male anatomy, virtual prostitutes and tiny animals, and this was all in my first week. Because this experience was so new for me, I was totally freaked out. I isolated myself. I did not know how to interact with these people in "this game." As time went on, I realized this was not a game at all. However, it did still take me a while to realize that whatever I did in this virtual world did indeed have real life repercussions on people. Things I would say or do only in fun hurt people very badly. I still regret some of things I did and said as I was exploring this new virtual place. However, I was ignorant of the culture, and it took me a while to learn that an avatar presents a person's heart, and a person's soul. Some people never do learn that, which can be the ugly thing about virtual worlds. You see what equates itself to what you may remember from high school. There are cliques. You have the haves versus the have nots. Those with different interests lump themselves together and are looked at is freaks by the rest of the community sometimes. You have those that have genuine hearts and try to treat everyone the same, then have rumors spread about them because they are an enemy's friend (these are supposedly adults I mind you!). Along with the rumors and the cliques, you have those who feel they are entitled in some way to special treatment. It could be they feel all should fall at their feet for their great knowledge in the VW realm, those who feel you should know they are a "Big Name," and those who think if you are their friend, you will give them anything they ask. It can get to be quite a mess. It almost seems necessary, though to friend these people if you would like to be considered part of the professional community which are the creators of items in these virtual worlds. So why am I still in a virtual world five years later, you may ask? The answer is simple. The good really does weigh out the bad, at least in my life. It took me a while to realize where my place was in the Virtual World Circuit. I tried being bad (some may say a griefer), I tried the partner thing, I tried creating, and I tried being social versus nonsocial. In the end, I discovered that being in a virtual world helped me rediscover myself in many ways. First, it made me where I became more social. I was not as intimidated to speak to an avatar as I would a real life stranger. Though virtual worlds, I have made some of the best friends I have ever had in my life. I am not nearly as shy as I was 5 years ago. I am more apt to tell others the truth about what I think, good or bad. Some even say I am a bit wittier these days. Personally, I feel I have always had a bit of wit to me, I just was too shy to share it. Secondly, virtual worlds allow me to be creative. I have always had an interest in art, but had never found a medium that seemed to be "me." I have won contests at county fairs with water colors and pastels, but did not like the fact I could not make my art look "real". Oil paints were too messy. I am good with pencil, but again, I felt it lacked something. Once I discovered virtual art, I knew I had found my medium. Sure, I may not make but 50 cents if someone buys something I create in a virtual world, but its not the money I am after. It is the enjoyment. Some may say people who spend time in virtual worlds are wasting too much time, or should be doing something else. What are they doing though? Most likely, they can tell you about 2 or 3 soaps, and inform you about many episodes of prime time tv. Lastly, virtual worlds give me confidence. Knowing others appreciate my creations makes me feel good. When someone compliments me on a creation, it gives me a feeling of satisfaction. So being there, in part, may be a bit selfish. However, we all need to feel appreciated. So, for me, I will choose to stay in this realm until it vanishes, which I cannot see it doing any time soon. Is it right for everyone? Absolutely not. Are there people I come in contact with I want to smack? Absolutely! However, in general, I feel that becoming part of the virtual world society has enhanced my life and my sense of being.